Belize, which is situated between Mexico and Guatemala, is a bit of an oddity within Central America; it is the only country which speaks English! 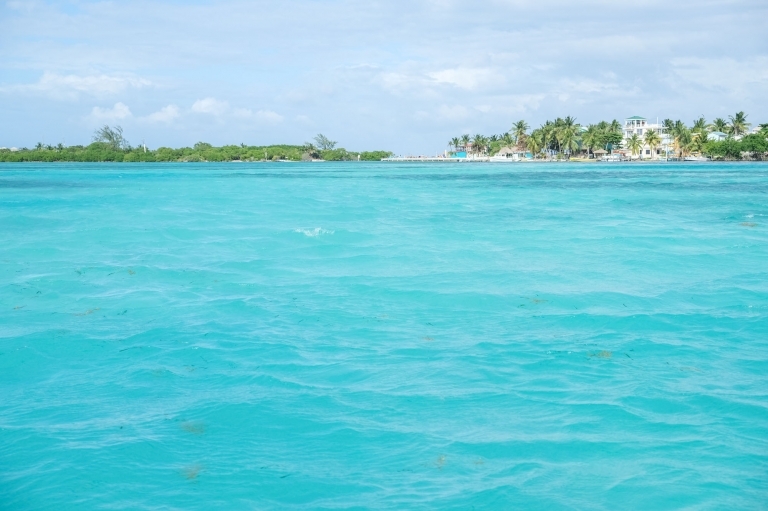 Belize coast line draws parallels with many Caribbean Islands for its beautiful white sand beaches and ultra laid back atmospheres – with a lackadaisical approach to alcohol and partying! Formerly known as British Honduras it was a British colony until 1981. The weather can be a challenge but for those interested in marine life, the ocean is full of life and snorkelling and scuba-diving are prevalent activities. For others the animals and history will provide a fascinating incite into the ancient, Mayan world. The official language of Belize is English whilst Belizean Creole is also an unofficial spoken language. Approximately 50% of Belizeans self-identify as Mestizo, Latino or Hispanic and 30% speak Spanish as a native language. Over half the population is multilingual. Being a small, multi-ethnic state, surrounded by Spanish-speaking nations, multilingualism is strongly encouraged with Spanish being taught in schools alongside English. Belize is also home to three Mayan languages: Q’eqchi’, Mopan and Yucatec Maya. Belize’s currency is the Belizean dollar $ which is pegged with the American $ at 2:1. ATM’s can be found in cities and larger towns and some shops, supermarket and restaurants. Citizens of the following countries can visit Belize for a period of up to 30 days: Any person who is the holder of a valid United States of America (USA) multiple entry visa or a Permanent Residency Card OR a valid Schengen multiple entry visa for a European Union (EU) member state. Citizens of the European Union Member States (EU) and their dependent territories. Citizens of the Caribbean Community Member States (CARICOM) with the exception of Haiti. Citizens of the United States of America and dependent territories. Citizens of South American countries. Citizens of South Africa, Tunisia, Morocco. Citizens of Switzerland, Norway, Iceland. Citizens of the Commonwealth Republics with the exception of the following: Bangladesh, Nauru, Cameroon, Pakistan, Chad, Sri Lanka, India, Mozambique, some East African Countries. To confirm whether or not you need a visa, please see full country list. All other nationalities require a visa for any visit to Belize. A bed in a hostel costs around $20-30 per night whereas private rooms in hostels might cost $70-100 per night. Free WiFi is usually included in hostel stays and some include breakfast. The quality can vary wildly so be careful to read reviews prior to booking. Airbnb (get $25 off your booking) is available in certain locations with prices generally between $50-100 per night. Booking.com offers a comprehensive list of hotels, hostels, guest rooms and private villas/houses. Hotels vary from $70 -400+ per night depending on which type of hotel and how many rooms you have. Most hotels have interconnecting rooms or apartment style rooms. Quality can be a concern however! Belizean food can be expensive. A basic restaurant meal for one will cost about $10-30. Most meals revolve around fish or chicken. Plant based food restaurants are not easy to find outside the main cities. We found that we could order some of the side dishes and turn them into sharing plates. If you plan on buying and cooking your own food, fresh produce is available from small market shops, markets and supermarkets. Supermarkets can be found in most towns and cities although at a price. Expect to pay about $150 for a family week shop. Hiring a car proved arduous and prices were extortionate. Most international renters do not operate in Belize and rental agencies are small and locally owned, many with no website. In the end we gave up and used public transport. Buses are the cheapest option with most fares starting in the low dollars however be careful of con men trying to sell you overpriced tickets. There are some ferries and you can book and pay for these online prior to arrival. See our post on Belize Ferries. Taxis are said to be reasonably priced but I always ask how much and negotiate the fare before getting in. The blue hole – Diving or snorkelling the blue hole is a fantastic but expensive activity. If you do get the chance, I’d recommend it. The Cayes – This area is the heart of Bulgaria’s summer tourism and with 378 km of coastline, it isn’t hard to figure out why. White and golden sandy beaches occupy approximately 130 km of the 378 km long coast which has sadly become dominated by high rise hotels, private areas, deckchairs, bars and summer apartment blocks. There are just a handful of beach areas on the coastline that could be described as wild or natural. Barrier Reef – There are a number of reefs within Belize’s water that are teeming with fish and marine life. Actun Tunichil Muknal cave tour – Running from the border of Serbia right down to the Black Sea, this enormous mountain range, 560km to be precise, divides the country in half. Hiking the mountains is plentiful and you’ll discover areas such as The Valley of the Roses and its festival as well as old oak trees, waterfalls, caves with paintings and monasteries.